Years Built – Content forthcoming. Please check back! AEI Services – Erosion control, earth moving, rock hammering, storm sewers, sanitary sewers, waterline, topsoil, and seeding. Summary – Our work here reflected a unified vision between AEI and one of its most valued customers. 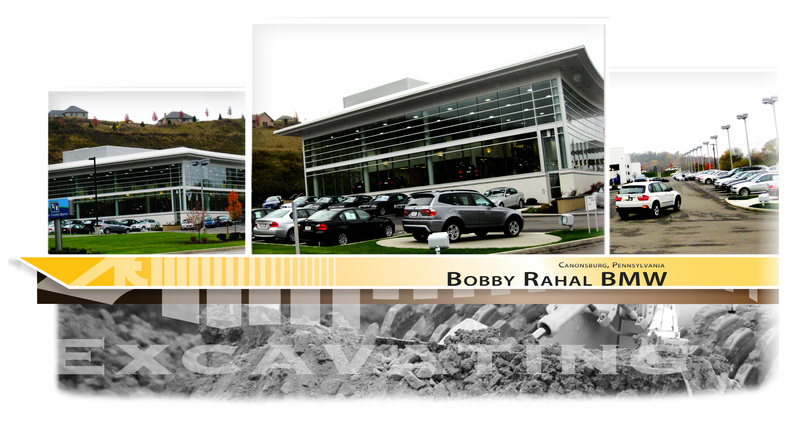 Bobby Rahal Automotive Group and AEI share an appreciation for attention to detail and aesthetics. Mr. Rahal’s dedication and vision combined with AEI’s commitment to excellence produced a “Class-A” finished product. The project itself was 99 acre site consisting of retail, automotive, and residential site. It was a prime example of AEI’s ability to find quick, efficient solutions to challenges on the work site. During the project, AEI moved over 850,000 cubic yards of material, of which 400,000 cubic yards was rock that was unable to be blasted. The prevalence of rock swells made adjusting the elevations of the Fifth 3rd Bank and “Bobby Rahal.” We shifted our focus and decided to make the necessary adjustments in the residential portion of the project. Our Trimble GPS guided machine controls and rover allowed us to overcome these challenges, helping us redesign the site as needed.